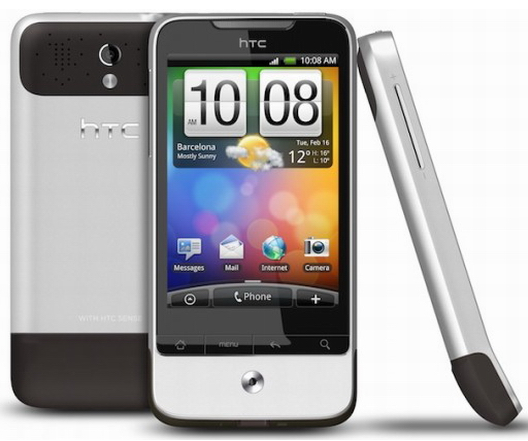 HTC today announced an Android based smartphone, Legend at MWC 2010 along with HTC HD mini and HTC Desire. HTC Legend is considered to be an update for existing HTC Android phone HTC Hero. HTC Hero was the first high profile Android phone with 5MP camera and HTC sense UI. Powered by the latest Android 2.1 version and new updated HTC sense UI, HTC Legend is expected support multi-touch and Flash. The major attraction of HTC Legend is its full metal body that offer great external appearance and protection against accidental drop. HTC Legend is too impressive in the specification side. It has a 3.2 inch AMOLED display, 5MP camera and 600MHZ processor. As seen the image, HTC Legend has an optical track pad, and full aluminum enclosure. The sense UI over Android makes it much user friendly. HTC Legend include applications for social media, navigation and weather updates. The tab like menus, that belongs to Sense enables users to access these applications, email, messages, contacts very easily using touch scrolling. HTC Legend contact menu is very special that we can get all information of person though this feature. We can add favorite contact with photo, sync it with Facebook profile to download details, read updates, check old communications etc. Like Hero, HTC Legend comes with 5MP camera with auto focus, LED flash and video recording. HTC Legend has a 3.2 inch AMOLED capacitive touch screen display with 16 million color support and 320 x 480 pixels resolution. This screen also has multi-touch, accelerometer sensor for great user experience. 5MP camera with LED flash, auto focus, and Geo-tagging. 3.5 mm headphone jack, speakerphone and Micro USB port. HTC Legend hardware specs includes Qualcomm 600 MHz processor with384 MB RAM and 512 MB ROM. External storage upgradable up to 16GB. Bluetooth with A2DP, Google applications, muli-touch enabled HTML web browser with Flash, A-GPS, GPRS, EDGE, 3G, quad-band GSM and WiFi. The latest market price of HTC Hero is around 550 USD. So on it launch, scheduled April of this year, HTC Legend would cost around 650 USD in US and 3o000 INR in India. HTC Legend price updated: As per Amazon web store UK, the new HTC Legend will be available at their store for a price of £399.99 from this April 1. Converting with the current rates, the price of HTC Legend in US would be around 560$. that’s be interesting. i saw the phone sell with Windows mobile 6.5..Hero G3..
Buy online and get home delivered brand new HTC Legend just for INR 28,800. Prem saharan,i m interestd in ur deal. Did you buy the HTC legend from Vinod Slaria or 23k how is it and give your 1st hand review is it worth buying.What is its current market price. Hope it has come down.